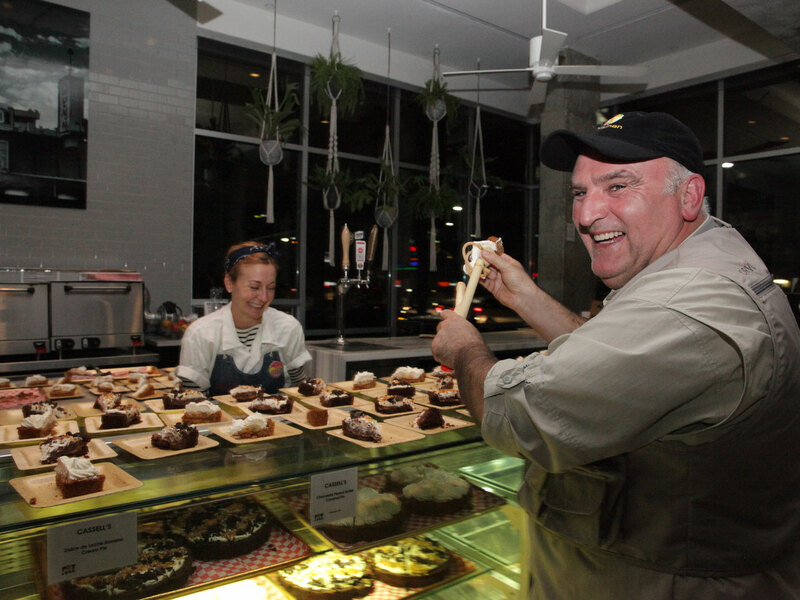 José Andrés was in the kitchen of L.A.’s Line hotel on Tuesday night, reminding us of the impact a great chef can have in 2017. He wasn’t there to cook, which made sense, because he deserved a break. All he’d been doing recently was cooking. He had spent the day, like all of his days in the last two weeks, feeding Southern California wildfire victims and first responders. By Tuesday night, Andrés estimates, his World Central Kitchen/L.A. Kitchen relief effort had made close to 30,000 meals. And this, of course, is after Andrés and his team served more than three million meals in Puerto Rico. Andrés was at The Line in Koreatown on Tuesday because his friends Roy Choi and David Chang had put together a blowout bash known as POTLuck. It was, Choi says, a party welcoming Chang to L.A. while also being a fundraiser for Andrés’ World Central Kitchen. One of the chefs who’s volunteered is Chang, who’s in town working on the early 2018 opening of his first L.A restaurant, Majordomo. 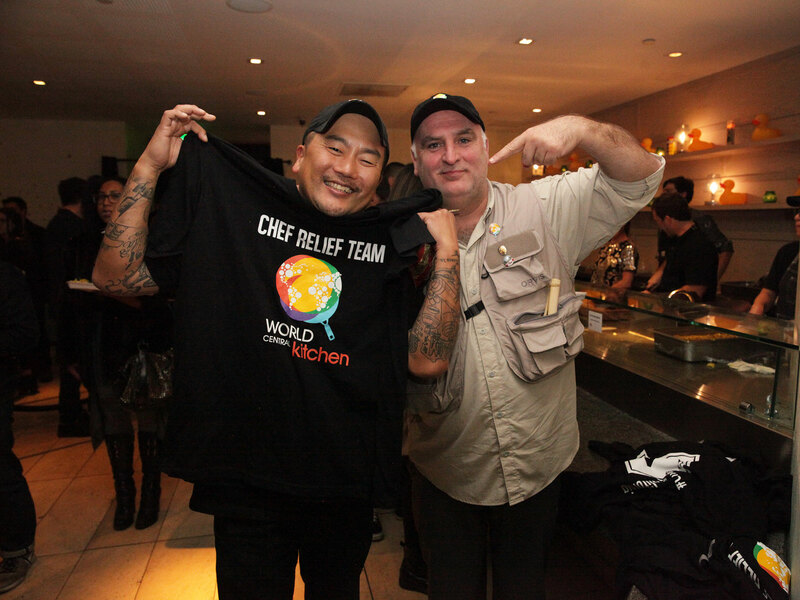 Chang gives all the credit to Andrés for getting chefs involved in the relief effort. Yes, community. You felt a sense of community all night at POTLuck, where so many of L.A.’s best chefs showed up to cook and wish Chang well on his new restaurant, while Andrés and L.A. Kitchen’s Robert Egger got many hugs and high-fives for the relief work they’ve done. Here are some highlights from a wonderfully crazy night in L.A. The event was set up like a meat-and-three restaurant. But in this case, guests got three meats and more than a dozen sides and desserts. You needed two big trays to fit all the savory food alone. Chang, Choi and Adam Perry Lang were in charge of meats. Chang and Majordomo executive chef Jude Parra-Sickels (who’s reunited with his former New York boss Chang after moving to L.A. and working with Choi) had fried chicken. Choi served spicy pork with kimchi. Lang sliced meat off beef ribs. Diep Tran of Good Girl Dinette, fresh off her appearance on The Migrant Kitchen (she’s in the Vietnamese food episode with Cassia’s Bryant Ng and Kim Luu-Ng) was positioned right next to the Chang/Choi/Lang meat stations. She served turmeric dill potato hash and posed for photos with Chang, who recently tweeted about enjoying the second season of The Migrant Kitchen. San Francisco chef Josh Skenes, who has three Michelin stars at Saison, will be making his L.A. debut next year with Angler, a seafood restaurant at the Beverly Center. He got into the spirit of POTLuck by serving braised collard greens with country ham. With all the excitement surrounding chefs about to open their first L.A. restaurants, a murderers’ row of local empire-builders were plating sides at POTLuck and reminding the city that they won’t be denied. It’s some kind of insane special night when the chefs serving sides like macaroni and cheese, yams, carrots, green beans and potatoes include Providence’s Michael Cimarusti (who recently opened the Ace Hotel’s Best Girl and Eataly’s Il Pesce Cucina in the same week), Rustic Canyon’s Jeremy Fox (who opened Tallula’s this year and is the process of creating his dream restaurant), Michael Voltaggio (who recently opened Ink.Well and Strfsh), Kris Yenbamroong (who’s close to opening his Venice outpost of Night + Market), Ludo Lefebvre (who’s close to opening his Sherman Oaks outpost of Petit Trois), and Jon Shook and Vinny Dotolo (who are in the process of expanding Jon & Vinny’s to Brentwood). Can’t stop/won’t stop chefs like this are the biggest reason why the future of L.A.’s dining scene will be even more exciting than the present. Milk Bar’s Christina Tosi showed up to party and parked herself behind the desserts made by restaurants like Republique, Cassell’s and Sqirl. Tosi had just finished a whirlwind weekend of packed pop-up events in L.A. (including an appearance at Smorgasburg) and was flying back to New York on a 1 a.m. red-eye, just in time for the pastry chef to make “normal business hours” for her New York workday. And it’s just the beginning of a wild span where she’ll open a Milk Bar on L.A.’s Melrose Avenue in early 2018, not long after Chang debuts Majordomo and other New York brands like The NoMad are unveiled in L.A. “I don’t know if you saw, but Dave and I were literally gossiping in the corner,” Tosi says. “It makes me really happy. For me, Dave’s been my brother forever. That we’re opening in L.A. within a month or two of each other, it feels good, it feels right." And being at POTLuck really made Tosi feel the strength and closeness of L.A.’s chef community. “To do something like this with the community and for the community that we’re excited to be part of, it’s really powerful,” Tosi says. Choi gave Chang all the credit for what POTLuck became. Choi was introduced to Chang years ago by Nancy Silverton, who connected the chefs during a dinner at Jitlada. It was the early days of Choi’s Kogi food truck, and something Choi said during a panel discussion with Jonathan Gold about Kogi’s rise resonated with Silverton. Silverton told Choi she wanted him to meet someone. Choi showed up at Jitlada, Chang was there and a deep friendship began. So things felt full circle on Tuesday at Choi’s Koreatown hotel. Silverton’s Mozza was part of the dessert lineup. Jitlada proprietor Jazz Singsanong served fried rice and urged guests to try some of the uncompromisingly spicy sauce she had. It was a night to celebrate L.A. food’s past, present and future. Welcome to L.A., David Chang.